Now, they don´t get itchy. But, there a bugs in this box. 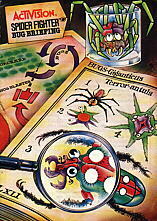 Lots and lots and lots of ceepy, crawly, pesky spiders. And, they want your fruit. Your plump grapes, juicy oranges, picture-perfect strawberries and, oh-my-gosh, there go your bananas! You´ve got to stop ´em. Got to smite ´em and fight ´em with all your might. Because if you don´t, they won´t just get your fruit, they´ll get you! 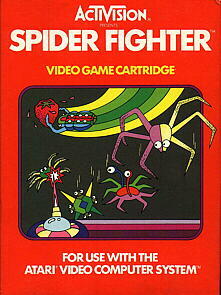 Spider Fighter. No joke. No picnic. 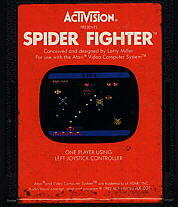 A real knockdown, dragout spider fight - from Activision.